Coach Pete Carroll said Baldwin (knee/shoulder) will require "6-to-8 weeks" to recover from his upcoming sports hernia surgery, Brady Henderson of ESPN.com reports. Baldwin (knee/shoulder/groin) is scheduled for sports hernia surgery in April, Bob Condotta of The Seattle Times reports. Baldwin (knee/shoulder) may require surgery to address a sports hernia in early April, Mike Garafolo of NFL Network reports. Coach Pete Carroll relayed that Baldwin is rehabbing from offseason knee and shoulder procedures, Bob Condotta of The Seattle Times reports. Baldwin hauled in three of six targets for 32 yards in Saturday's loss to the Cowboys. Baldwin (knee) wasn't listed on the Seahawks' injury report for Saturday's wild-card game against the Cowboys, Gregg Bell of The Tacoma News Tribune reports. Analysis: Baldwin graduated from no participation Tuesday to limited practice participation Wednesday, a good sign that he would give it a go Saturday. His absence from the team's final injury report ensures that will be the case, setting the stage for Baldwin to continue to head his team's wideout corps this weekend. Baldwin (knee) was listed as a limited participant on Wednesday's practice report, John Boyle of the Seahawks' official site reports. Baldwin was listed as a non-participant at Tuesday's practice with a knee injury, John Boyle of the Seahawks' official site reports. Baldwin corralled two of five targets, accumulating 27 receiving yards during Sunday's 27-24 win against the Cardinals. Baldwin (shoulder) was a full practice participant Friday and doesn't have an injury designation for Sunday's game against the Cardinals, John Boyle of the Seahawks' official site reports. Baldwin (shoulder) doesn't have a designation on the final injury report for Sunday's game against the Cardinals, Bob Condotta of The Seattle Times reports. Coach Pete Carroll said Baldwin (shoulder) will be a game-time decision Sunday against the Cardinals, Brady Henderson of ESPN.com reports. Analysis: Locked into a wild-card spot and facing a lackluster opponent, the Seahawks may lean toward a cautious approach, though they still have incentive to win if they'd rather face the Cowboys than the Bears in the playoffs next week. After returning to practice Thursday as a limited participant, Baldwin seems to be headed for a "questionable" designation when the Seahawks release their final injury report Friday afternoon. An absence would free up more work for David Moore and Jaron Brown. Baldwin (shoulder) practiced in a limited fashion Thursday, John Boyle of the Seahawks' official site reports. Baldwin (shoulder) was a non-participant at Wednesday's practice, John Boyle of the Seahawks' official site reports. Analysis: Prior to this week, Baldwin's practice reps were impacted by knee, groin and hip issues to this point in the season. It remains to be seen what kind of workload he'll be able to muster with a shoulder concern, but he has two sessions to build up his reps from nothing to something. Baldwin has been scintillating since his last absence Week 14, accounting for 11 catches (on 18 targets) for 203 yards and three touchdowns over the last two contests. Baldwin hauled in seven of 12 targets for 126 yards and a touchdown in Sunday's win over the Chiefs. Baldwin (hip) practiced fully Thursday, Brady Henderson of ESPN.com reports. Baldwin (hip) was held out of practice Wednesday, John Boyle of the Seahawks' official site reports. Baldwin caught four of six targets for 77 yards and two touchdowns in Sunday's overtime loss to the 49ers. Analysis: Baldwin was able to uphold a prediction from coach Pete Carroll, who said the wide receiver "looks like he's playing" after Friday's practice, according to John Boyle of the Seahawks' official site. In his previous nine appearances, Baldwin was on the field for at least 75 percent of the offensive snaps, so potential work will be there. One of those contests was a Week 13 matchup with the 49ers, which allowed Baldwin to rack up two catches (on four targets) for 22 yards. Baldwin (hip), who is listed as questionable for Sunday's game against the 49ers, is expected to play, a source told Ian Rapoport of NFL Network. Coach Pete Carroll said Baldwin (hip) looked good in practice Friday and is now on track to play in Sunday's game at San Francisco, John Boyle of the Seahawks' official site reports. Baldwin (hip) is listed as questionable for Sunday's game at San Francisco, John Boyle of the Seahawks' official site reports. Analysis: The designation was safe to assume after coach Pete Carroll hinted Friday that the 30-year-old wideout could come down to a game-time decision ahead of Sunday's 4:05 PM ET kickoff. Baldwin was held out of practice Wednesday, but he returned Thursday as a limited participant and is expected to give it another shot Friday afternoon. A Week 15 absence would free up regular snaps for Jaron Brown in three-wide sets alongside Tyler Lockett and David Moore. Coach Pete Carroll expects Baldwin (hip) to be a game-time decision Sunday at San Francisco, 710 ESPN Seattle reports. "Doug practiced late in the week and if everything goes well all the way up to game time he has a good chance to play," Carroll said Friday. Analysis: Carroll sounded far less optimistic earlier in the week, noting Wednesday that Baldwin "may pull off another one of his miracles and get back to play." It now seems a more favorable outlook has taken hold after Baldwin practiced Thursday in a limited capacity, putting him on track to be listed as questionable on the final injury report. The Seahawks are scheduled for a 4:05 PM ET kickoff Sunday. Baldwin (hip) was listed as limited on Thursday's practice report, John Boyle of the Seahawks' official site reports. Analysis: After sitting out Wednesday's session, Baldwin has taken the first step toward making a return with some activity Thursday. As coach Pete Carroll noted Wednesday, the Seahawks will take Baldwin "one day at a time" in his effort to put a hip injury behind him, according to Boyle. Barring a surprise development, Baldwin seems destined to enter the weekend with a questionable designation, but Friday's injury report will confirm as much. Baldwin (hip) was a non-participant at Wednesday's practice, John Boyle of the Seahawks' official site reports. "He went through the walk-through," coach Pete Carroll told Boyle. "We'll just go one day at a time with Doug and never expect anything other than he may pull off another one of his miracles and get back and play. His mind is set on doing that. We'll see how he makes it though the week." Coach Pete Carroll said Baldwin (hip) participated at Wednesday's morning walk-through, John Boyle of the Seahawks' official site reports. Analysis: Eventually, Baldwin will receive a listing on the Seahawks' first Week 15 injury report, but even if he's tabbed as a non-participant, it won't be cause for concern yet. As evidence, Carroll added that the Seahawks are taking Baldwin's situation "one day at a time." Russell Wilson has mustered just 490 passing yards in Baldwin's three absences this season as opposed to 229.8 per game in 10 games together, so the wideout's status has been key for the aerial attack as a whole. Baldwin (hip) is inactive for Monday's contest versus the Vikings. The Seahawks continue to view Baldwin (groin) as a game-time decision for Monday's contest against the Vikings, but there remains real concern that he won't be available, Adam Schefter of ESPN reports. "I wouldn't think so, but you never know with Doug," a source told Schefter, when asked if Baldwin would play. "I'm sure he will try." Baldwin (groin) is expected to be a game-time decision for Monday's contest against the Vikings, Curtis Crabtree of Sports Radio 950 KJR Seattle reports. Baldwin (hip) was withheld from practice Friday, John Boyle of the Seahawks' official site reports. Analysis: After sitting out Thursday, it's somewhat worrisome that Baldwin was unable to upgrade to a limited or full practice Friday. On the other hand, regular bouts with injury this season may have forced the Seahawks to institute a more rigid maintenance program on the wideout. Baldwin's activity level at and subsequent listing on the injury report after Saturday's session could be key for his ability to play Monday against the Vikings. Baldwin didn't practice Thursday due to a hip injury, Bob Condotta of The Seattle Times reports. Baldwin hauled in two of four targets for 22 yards and a touchdown in Sunday's win over the 49ers. Analysis: Baldwin was targeted in the red zone twice, and he hauled the second one in for a 1-yard score. It saved Baldwin from another dud, as his fantasy value shrivels without touchdowns: He has surpassed 52 receiving yards just twice this year. It was Baldwin's second score in three weeks, though, and he tied running back Chris Carson for a team high in targets. Baldwin's task of finding the end zone will be more difficult in Week 14 against the Vikings. Baldwin (groin) doesn't carry an injury designation into Sunday's game against the 49ers, Curtis Crabtree of Sports Radio 950 KJR Seattle reports. Analysis: Baldwin played through the same injury without practicing in any capacity last week, catching five of seven targets for 39 yards in a 30-27 win over the Panthers. He avoided any setbacks during the game and has been able to partake in practice on a limited basis this week. Despite the improvement from a health perspective, Baldwin may have a tough time drawing targets in a run-first offense that probably won't need to do much throwing this week. Baldwin (groin) practiced in a limited capacity Thursday, John Boyle of the Seahawks' official site reports. Baldwin (groin) was held out of practice Wednesday, John Boyle of the Seahawks' official site reports. Baldwin caught five of seven targets for 39 yards in Sunday's win over the Panthers. Analysis: Baldwin led the Seahawks in targets for the second consecutive week, and he only saw one pass in the red zone. The veteran receiver may have been hindered by a groin injury that kept him out of practice all week, so his health should be monitored ahead of Week 13's matchup with the 49ers. Baldwin (groin) is active for Sunday's contest at Carolina, Adam Schefter of ESPN reports. Though Baldwin (groin) is listed as questionable Sunday against the Panthers and was previously labeled a game-time decision by coach Pete Carroll, the Seahawks believe the wideout has a "good shot" to play, a source told Ian Rapoport of NFL Network. Coach Pete Carroll said Baldwin (groin) will be a game-time decision for Sunday's contest at Carolina, Michael-Shawn Dugar of The Athletic reports. Analysis: Per John Boyle of the Seahawks' official site, Baldwin is officially listed as questionable after practicing in no capacity all week. Baldwin was contained to some running and little else Friday, leaving his last chance to prove the health of his groin issue in a pregame workout Sunday. Expect his status to receive clarity when the Seahawks release their list of inactives about 90 minutes before Sunday's 1:00 PM ET kickoff. Baldwin (groin) is listed as questionable for Sunday's game in Carolina, John Boyle of the Seahawks' official site reports. Analysis: Bob Condotta of The Seattle Times suspects Baldwin is healthy enough to play despite being listed as a non-participant on the Wednesday and Thursday injury report. We should have a better idea once the Seahawks release their practice statuses from Friday, as it would be somewhat concerning if Baldwin hasn't progressed to some form of participation. 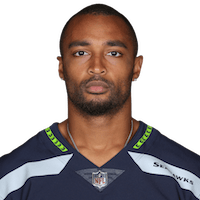 Baldwin (groin) was listed as a non-participant on the Seahawks' estimated injury report Thursday, John Boyle of the team's official site reports. Analysis: Coach Pete Carroll gave his players the day off, but Baldwin wouldn't have practiced for a second consecutive day Thursday if the Seahawks had held a session. The decision may be a precautionary one with Baldwin embroiled in an injury-plagued season, but his status is worth monitoring to ensure he's available for Sunday's game at Carolina. 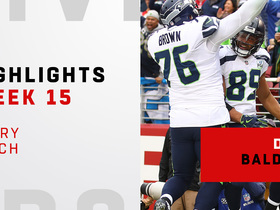 Baldwin (groin) sat out practice Wednesday, John Boyle of the Seahawks' official site reports. Analysis: Bothered by a pair of knee injuries and the groin issue more recently, Baldwin has often seen his practice workload scaled back this season. There wasn't any report of a setback or new injury after he caught seven of 10 targets for 52 yards and a touchdown in last Thursday's 27-24 win over the Packers. Any concern will be put to rest if Baldwin returns to practice Thursday as the Seahawks continue preparation for a vital game against Carolina this weekend. Baldwin caught seven of 10 targets for 52 yards and a touchdown in Thursday's 27-24 win over the Packers. Analysis: Days after Baldwin reported that his knee is painless, the wideout logged his first score of the year and recorded a season-high in targets. Baldwin will look to continue his upward trend in Week 12 against the Panthers, who have allowed the second-most passing touchdowns (22) this year. Baldwin said he finally feels healthy again, 710 ESPN Seattle reports. "It's been a very long time since I felt like myself," Baldwin said Tuesday. "Thursday last week was the first day I woke up in the morning and I didn't feel pain. I've been dealing with this for four months, and I forgot what it felt like to not have pain." Baldwin caught all five targets for 39 yards in Sunday's 36-31 loss to the Rams. Analysis: Tyler Lockett was the only wideout who was targeted more, but Baldwin was inefficient yet again with 7.8 yards per catch. None of those targets came in the red zone, either, and Baldwin still hasn't found the end zone. He'll look to break the trend against the Packers, who are facing injuries in the secondary, on Thursday. Baldwin (groin) doesn't have a designation for Sunday's road game versus the Rams, Curtis Crabtree of Sports Radio 950 KJR Seattle reports. Analysis: The Seahawks capped Baldwin's practice reps this week due to a groin injury, but the issue won't hinder him from taking the field for the upcoming divisional showdown. In the team's previous meeting with the Rams in Week 5, he was targeted just one time. However, he's accrued 12 receptions (on 15 targets) for 194 yards and no touchdowns in three games in the meantime. Baldwin (groin) was a limited practice participant Thursday, John Boyle of the Seahawks' official site reports. Analysis: Although he elevated from no activity Wednesday to some drills one day later, Baldwin has picked up a groin injury. Notorious for impacting mobility, it wouldn't surprise if the Seahawks continue to place a cap on his practice reps with his gameday viability in mind. Friday's injury report will relay whether or not Baldwin enters the weekend with a designation in tow. Baldwin was held out of Wednesday's practice with a groin injury, Curtis Crabtree of Sports Radio 950 KJR Seattle reports. Baldwin caught all four targets for 77 yards in Sunday's 25-17 loss to the Chargers. Analysis: Baldwin was tied for fourth in targets this week, but he still led the team in receiving yards. Fantasy owners should understand by now they won't get what they paid for Baldwin, as this was his second-best performance of his season since the veteran still doesn't have a touchdown. Baldwin (knee) practiced fully Thursday, John Boyle of the Seahawks' official site reports. Baldwin (knee) was a limited practice participant Wednesday, John Boyle of the Seahawks' official site reports. Baldwin caught two of three targets for 26 yards in Sunday's 28-14 win over the Lions. Analysis: Baldwin said his knee wouldn't be fully healthy this season, and it's clear he's still laboring from the issue. The veteran wideout hasn't scored through five games this season and has been targeted three or less times in three of those outings. Baldwin caught six of eight targets for 91 yards in Sunday's 27-3 win over the Raiders in London. Analysis: Baldwin finally looked like himself again, leading Seattle in targets, catches and yards. Unfortunately for Baldwin's fantasy owners, he was kept out of the end zone while three other Seattle receivers scored touchdowns. The veteran wide receiver will be playing at less than 100 percent throughout the year due to knee troubles, but he'll still be a serviceable option moving forward if he can replicate this performance. Baldwin and the Seahawks will be on bye in Week 7. Baldwin (knee) caught his lone target for one yard in Sunday's 33-31 loss to the Rams. Analysis: Although Russell Wilson attempted a season-low 21 passes, it's surprising to see Baldwin shut down so much, even against a solid Rams secondary. Assuming Baldwin didn't suffer any setbacks to his knee, he'll look to get on track in Week 6 at Oakland. Baldwin (knee) won't carry an injury designation into Sunday's game against the Rams, John Boyle of the Seahawks' official site reports. Analysis: Baldwin was added to the Seahawks' injury report Thursday due to the knee issue, which previously sidelined the wideout for Weeks 2 and 3. He returned to action in Sunday's win over the Cardinals, reeling in five of seven targets for 41 yards. The Seahawks provided no indication that Baldwin aggravated the knee injury over the weekend, so his limitations at Thursday's practice were likely just maintenance-related. 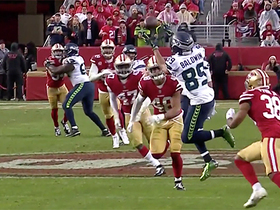 Expect Baldwin to again serve as the Seahawks' clear No. 1 wideout in Week 5. Baldwin was limited at Thursday's practice due to a knee injury, Rich Hammond of the Los Angeles Daily News reports. Analysis: Neither Pete Carroll nor Baldwin was given an opportunity to comment on the wide receiver's health Thursday. However, Baldwin likely took a maintenance day in the wake of his recent return from a two-game absence in which he parlayed 50 offensive snaps into a five-catch, 41-yard effort on seven targets. Even if he's given a questionable designation for Sunday's game against the Rams, he should be out there considering he logged a full practice Wednesday. Baldwin caught five of seven targets for 41 yards and zero touchdowns in Sunday's 20-17 win over the Cardinals. Analysis: Baldwin, who missed the previous two weeks with a sprained MCL, played 50 of 66 offensive snaps (75.8 percent) and only Tyler Lockett had more (62). His practice capacity should be monitored this week to see if Baldwin can jump into a true No. 1 wideout role Week 5 against the Rams. Baldwin (knee) is listed as active Sunday at Arizona. Analysis: A full practice to wrap up the week typically would be enough to clear a player for game action, but the Seahawks understandably waited until Baldwin tested out his right knee before doing just that. Making his first appearance since the regular-season opener, his snap count may be limited as a result. Nevertheless, Baldwin will seek to take advantage of the Cardinals' 19th-ranked pass defense (261 yards per game). Baldwin (knee) practiced fully Friday, but the Seahawks consider him questionable for Sunday's contest in Arizona, John Boyle of the Seahawks' official site reports. Baldwin (knee) is listed as questionable for Sunday's game in Arizona, with Gregg Bell of The Tacoma News Tribune suggesting all signs point to a return. Analysis: Baldwin returned to practice as a limited participant Wednesday and Thursday, prompting coach Pete Carroll to deem the veteran wideout ready for a return. All signs may point in the right direction, but it is worth noting that Carroll has a lengthy history of being overly optimistic -- or perhaps even intentionally deceptive -- when discussing player injuries with the media. We'll still want to check Seattle's inactive list approximately 90 minutes before Sunday's 4:05 PM ET kickoff. Coach Pete Carroll said he expects Baldwin (knee) to play in Sunday's game against the Cardinals, Stacy Jo Rost of 710 ESPN Seattle reports. "[Baldwin] looked great (in practice), he looked great," Carroll said. "He was explosive. ... We're really excited for him to play in this game." Analysis: Carroll has a track record of making these types of statements about players that end up on the inactive list, but his optimism is at least a good sign even if it needs to be taken with a grain of salt. Baldwin was a limited practice participant Wednesday and Thursday after sitting out entirely the previous two weeks. Another update will be available Friday afternoon when the Seahawks release their final injury report. Baldwin (knee) said Thursday that he feels "ready to go" for Sunday's game against the Cardinals, according to Brady Henderson of ESPN.com. Analysis: Baldwin conceded that a final call on his Week 4 status will be made by the coaching staff, but he believes he is ready to take the field after practicing on a limited basis both Wednesday and Thursday. The Eagles will provide an official update on Baldwin's status for Sunday's contest at some point Friday, but a final call on his availability may not come until game day. Baldwin (knee) remained limited at Thursday's practice, Brady Henderson of ESPN.com reports. Analysis: Given "a chance to play this week" by coach Pete Carroll on Wednesday, Baldwin himself is hopeful that a return is in the offing Sunday at Arizona, per Henderson. Baldwin would ease concerns about his availability with a full practice Friday, but his healing right knee may not cooperate. Ultimately, the final injury report of the week will list whether he has a chance to play for the first time since the regular-season opener. Baldwin (knee) practiced in a limited capacity Wednesday, John Boyle of the Seahawks' official site reports. Coach Pete Carroll said Baldwin (knee) will return to practice Wednesday and may be available for Sunday's game in Arizona, Gregg Bell of The Tacoma News Tribune reports. Analysis: Baldwin presumably will be eased in as a limited participant in his first practice session since suffering a sprained MCL in Week 1. Given the way Seattle has handled injuries in recent seasons, there's a good chance the 30-year-old wideout will be deemed a "game-time decision," even if the team knows its plan for him by Friday. A return to full practice participation by the end of the week would put Baldwin on track to play. Coach Pete Carroll didn't elaborate on whether Baldwin (knee) has a chance to play Sunday at Arizona, Bob Condotta of The Seattle Times reports. Analysis: After picking up a Grade 2 MCL sprain in his right knee in the regular-season opener, Baldwin was given a prognosis of "a couple weeks" from Carroll. With two weeks behind him, Baldwin could be a candidate to return Week 4, assuming his rehab is going as planned. On Monday, Carroll told Michael-Shawn Dugar of The Athletic that the Seahawks will have more information on Baldwin later this week, intimating he has a chance to practice in the near future. Baldwin (knee) has been ruled out for Sunday's contest against the Cowboys, John Boyle of the Seahawks' official site reports. Seahawks head coach Pete Carroll said Tuesday that Baldwin (knee) could be "a little further away" from returning to the field, suggesting the wideout likely won't be available Week 3 against the Cowboys, Mike Vorel of The Seattle Times reports. Baldwin (knee) has been ruled out for Monday's game against the Bears, John Boyle of the Seahawks' official site reports. Seahawks head coach Pete Carroll suggested Tuesday that Baldwin (knee) could be out "a couple weeks," Brady Henderson of ESPN.com reports. "[Baldwin is] really gonna go a few days at a time here," Carroll said. "Let's see what happens. We'll wait and see." Baldwin has a Grade 2 MCL sprain in his right knee, Adam Schefter of ESPN reports. Analysis: A Grade 2 sprain is a partial tear of the ligament -- an injury that typically leads to a multi-week absence. The Seahawks are still in the process of determining how much time Baldwin will miss, but it at least feels safe to call him a long shot for Monday Night Football against the Bears in Week 2. The injury isn't in the same knee that gave Baldwin issues throughout the summer. Coach Pete Carroll didn't have an update on Baldwin's knee injury during a Monday radio appearance on 710 ESPN Seattle, ESPN.com's Brady Henderson reports. "I haven't heard back," Carroll said. "[Baldwin] was sore last night, but he was walking OK and all that. He wasn't hampered in that regard. But he got hurt. He got hurt." Coach Pete Carroll said Baldwin has been diagnosed with an MCL sprain, John Boyle of the Seahawks' official site reports. Baldwin won't return to Sunday's contest at Denver due to a knee injury, Curtis Crabtree of Sports Radio 950 KJR Seattle reports. Baldwin (knee) practiced in full Wednesday, John Boyle of the Seahawks' official site reports. Analysis: Baldwin spent all of training camp and the preseason answering questions about his sore left knee. In particular, he noted Aug. 28 that he may deal with the injury all season, which could stand to limit his practice reps at certain points. Assuming the management of his knee allows him to uphold his normal workload, Baldwin should receive about 7.2 targets per game (his mark from 2015 through 2017). Baldwin said Tuesday that he will play Week 1, but he also acknowledged his knee injury is something that will require management throughout the season, Bob Condotta of The Seattle Times reports. Seahawks head coach Pete Carroll said Baldwin (knee) has increased his activity level at practice this week and remains on track to play in the team's regular-season opener in Denver, Bob Condotta of The Seattle Times reports. Analysis: Gregg Bell of The Tacoma News Tribune relays that Baldwin took part in position drills Monday for the first time since late July. It's a clear step forward for the wide receiver, supporting Carroll's repeated assertions that Baldwin will be fine for Week 1. The Seahawks haven't provided any details on Baldwin's injury beyond referring to it as "knee soreness." Coach Pete Carroll still expects Baldwin (knee) to be ready for Week 1 and even said the wideout could play in the final week of the preseason, Gregg Bell of The Tacoma News Tribune reports. "He'll want to play next week." Carroll said. "We'll make that determination next week. He's going to be there for the opener." Seahawks coach Pete Carroll suggested Baldwin (knee) could return to practice in the final week of August, Gregg Bell of The Tacoma News Tribune reports. Analysis: Baldwin ran sprints on a side field Thursday and is hoping to ramp up his activity level over the next few weeks. Carroll once again stated his expectation that the 29-year-old wideout will be available for the team's regular-season opener despite missing the entire preseason and the vast majority of training camp. Baldwin (knee) ran sprints on a side field during Thursday's practice, Michael-Shawn Dugar of The Athletic Seattle reports. Analysis: Since the Seahawks took the field for training camp July 26, Baldwin has been a non-participant. First, he was wearing a protective sleeve on his left leg on the sideline. By the end of last month, the injury had been clarified as a sore knee, which likely will force absences throughout the preseason slate. Coach Pete Carroll has nonetheless said Baldwin will be ready by Week 1, and sprinting in mid-August would seem to indicate the wideout is on the right path. Seahawks coach Pete Carroll reiterated Tuesday that he expects Baldwin (knee) to be ready for Week 1 against Denver, Brady Henderson of ESPN.com reports. Seahawks coach Pete Carroll said Friday that he no concern about Baldwin (knee) missing the start of the regular season, John Boyle of the Seahawks' official site reports. Analysis: After fighting through some knee soreness at the beginning of training camp, Baldwin is now being held out of practice and may end up missing the entire preseason. The situation will require careful monitoring in the coming weeks, even though Carroll seems confident that Baldwin's knee will heal with rest. The Seahawks will be in serious trouble if the injury lingers, as Tyler Lockett is the only other player on the roster who reached 500 receiving yards last year. Baldwin (knee) is in danger of missing the entire preseason, but his doctors are confident he will be ready for the start of the regular season, Adam Schefter of ESPN reports. Baldwin is recovering from knee soreness and is expected to miss a couple more weeks of practice, Gregg Bell of The Tacoma News Tribune reports. Baldwin (leg) isn't practicing Tuesday. Analysis: While he isn't working with his teammates, Baldwin did come out on the field to watch practice and tossed a ball around with coach Pete Carroll. The veteran wideout still has a wrap over his left leg, but there hasn't been any suggestion of a significant injury. Baldwin is locked in as the No. 1 target in an offense that lost Jimmy Graham and Paul Richardson during the offseason. Baldwin, who is sporting a wrap on his left leg, did not practice Monday, Bob Condotta of The Seattle Times reports. Analysis: At this stage, we'll operate under the assumption that the Seahawks are simply exercising caution with their top wideout. Following the free-agent departures of Jimmy Graham and Paul Richardson, Baldwin's import (and volume) in the team's passing game figures to grow this coming season on the heels of a 2017 campaign in which he logged 75 catches (on 117 targets) for 991 yards and eight touchdowns. The connection between Baldwin and Russell Wilson could be the key component of the Seahawks offense in 2017 due to the free-agent departures of Jimmy Graham and Paul Richardson, Andy Patton of USA Today reports. Baldwin finished the year nine yards shy of his third consecutive 1,000-yard season, posting 75 receptions and eight touchdowns. Baldwin hauled in four of five passes for 90 yards and two touchdowns during Sunday's 26-24 defeat to the Cardinals. Baldwin caught four passes for 35 yards and one touchdown on six targets against Dallas on Sunday. Analysis: The volume was disappointing, but given that Russell Wilson threw for just 93 yards, this showing was a very strong one by Baldwin in terms of share percentages. Wilson should post bigger numbers against the Cardinals in Week 17, and such an outcome would present Baldwin the opportunity to accumulate some volume. Baldwin posted his fewest receiving yards since 2014 in Sunday's loss to the Rams, catching one of four targets for six yards. 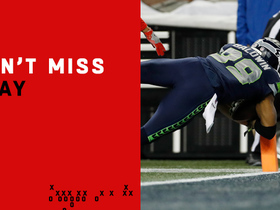 Analysis: Russell Wilson badly missed on a deep throw in the first quarter that would have changed Baldwin's fantasy fortunes. But it's disappointing the Seahawks couldn't get their best receiver more involved. Such is life for an inconsistent Seahawks offense that cannot run the ball at all, thereby allowing opponents to play nickel defense most of the game. However, Baldwin faces a Dallas defense in Week 16 that allows the fifth-most fantasy points per game to wide receivers. Baldwin brought in three of six targets for 78 yards and a touchdown in Sunday's 30-24 loss to the Jaguars. Analysis: Baldwin's 26-yard scoring grab with 7:32 remaining in the third quarter represented the Seahawks' first touchdown of the afternoon. It was also since the Week 11 loss to the Falcons and helped give the veteran receiver back-to-back strong performances. Baldwin has posted eight catches (on 13 targets) for 162 yards and Sunday's score in the last two games, and his contributions will undoubtedly be key in a Week 15 battle against the Rams. Baldwin caught five of seven passes for 84 yards during Sunday's 24-10 victory over the Eagles. 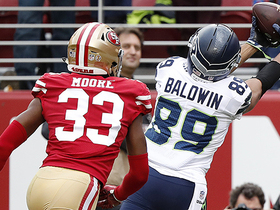 Baldwin caught two of three targets for a season-low 25 yards in a win at the 49ers on Sunday. Analysis: Quarterback Russell Wilson spread the targets to eight receivers, which partially explains Baldwin's lack of involvement. A fourth target was wiped out on a defensive pass interference call. Also, Wilson attempted 34 passes, slightly fewer than the nearly 40 he averaged the previous six games. Add it all up, and Baldwin was left with a low-key day. Baldwin caught two of six targets for 40 yards and a touchdown in Monday night's 34-31 loss to the Falcons. 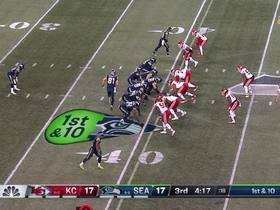 Analysis: Baldwin was uncharacteristically quiet prior to scoring a 29-yard touchdown on Seattle's second-last offensive drive. While that salvaged his performance Monday, it also gave Baldwin a score in three of his last five games. With three 90-plus-yard outings over that span as well, Baldwin has considerable momentum going into a fantastic Week 12 matchup versus the 49ers. Baldwin (groin) practiced fully Thursday, John Boyle of the Seahawks' official site reports. Baldwin reported that he suffered a minor groin injury prior to Thursday's game against the Cardinals, Gregg Bell of The Tacoma News Tribune reports. Analysis: Baldwin made his distaste of Thursday night games very clear, as he alluded to the fact that he was unable to get loose prior to the game, thus leading to his nagging groin injury. The veteran receiver was able to effectively play through the pain however, racking up 95 yards on five receptions. He'll have 10 days to recover prior to the Seahawks' Week 11 matchup with the Falcons next Monday night. Baldwin caught seven of 12 targets for 108 yards and a touchdown in Seattle's 17-14 loss to Washington. 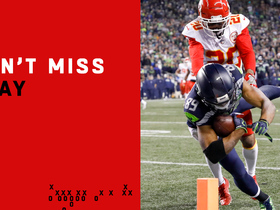 Analysis: The touchdown went for 30 yards and was Seattle's longest play of the day. Since the Week 6 bye, Baldwin hasn't seen fewer than six receptions or ten targets and has touchdowns in two of his last three games. He continues to head the Seahawks' receiving corps as they travel to Arizona to take on the Cardinals in Week 10. NFL Network Insider Ian Rapoport discusses the NFL future of Seattle Seahawks wide receiver Doug Baldwin. 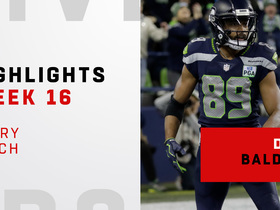 Watch every catch from Seattle Seahawks wide receiver Doug Baldwin's 126-yard night in his Week 16 matchup against the Kansas City Chiefs. 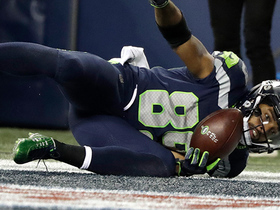 Seattle Seahawks wide receiver Doug Baldwin taps pass to himself on spectacular 29-yard grab. Seattle Seahawks quarterback Russell Wilson hits wide receiver Doug Baldwin for an incredible 27-yard touchdown pass. Seattle Seahawks quarterback Russell Wilson extends the play to hit wide receiver Doug Baldwin for 16-yard sideline hookup. 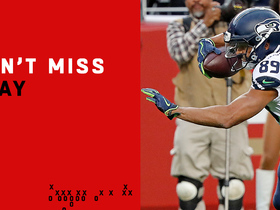 Seattle Seahawks quarterback Russell Wilson's pinpoint pass hits wide receiver Doug Baldwin for 18-yard pickup. Seattle Seahawks quarterback Russell Wilson hits wide receiver Doug Baldwin over San Francisco 49ers cornerback Richard Sherman for a 35-yard touchdown. 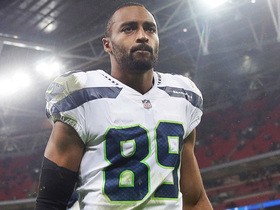 Watch every catch from Seattle Seahawks wide receiver Doug Baldwin as he makes his return to the field against the San Francisco 49ers. Seattle Seahawks wide receiver Doug Baldwin makes a tremendously difficult catch to pick up 27 yards against the San Francisco 49ers. Seattle Seahawks wide receiver Doug Baldwin gets a big reach and grab 5-yard touchdown against the San Francisco 49ers.